And then World War II happened. The chills provided by the Universal monsters swiftly paled in comparison ton the all-too-real horrors of devastating international conflict and the shattering, violent loss of life on all sides. Cities bombed into rubble, millions put through unspeakable torture (and worse) in concentration camps, and more defined an era in which man's mettle was tested as never before, so what power did Gothic castles, man-made monsters, and vampires who were clad like they were about to attend a performance of LA BOHEME hold over the collective psyche of the average civilian? A pasty Hungarian showing up in one's bedroom to get a sanguinary taste straight from the tap was simply not going to happen, unlike the very distinct possibility of suddenly finding oneself one a beach in some foreign land and trying to stay alive as bullets and shells rained down upon you while trying not to step in the shattered, disembodied limbs of one's fallen comrades. Though the Universal horror cycle continued during this period, the entries bore a marked difference to the eerie narratives that had kickstarted the genre. Coupled with the baleful spectre of international warfare, Hollywood's balls had been effectively lopped off by the Hays Code, which hyper-sanitized the movies to a degree where nothing that they presented could have offended even the most uptight of Carmelite nuns. Consequently, horror movies in general and those released by Universal in particular, It all became about keeping things family-friendly and upbeat. Musicals, family dramas, lighthearted comedies, and other saccharine fare were the order of the day, and for a good while true cinematic horror mostly lay fallow. What did get released were mostly low-budget potboilers that were consumed and almost immediately forgotten, though a handful of genuine classics did manage to squeak through. That said, the Universal series had devolved into rote and kinda cutesy "monster rallies" that united all of the brand's stable of bogeymen in time-killing matinee fare. HOUSE OF DRACULA, HOUSE OF FRANKENSTEIN, FRANKENSTEIN MEETS THE WOLF MAN and so on were fun enough but the real magic was gone. 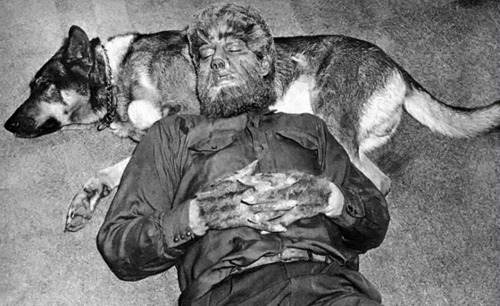 The only interesting thread running through that batch of films was that Larry Talbot, aka the Wolf Man, was now immortal and in search of either a cure for his lycanthropic condition or simply a way to end it all.